Wizergos’ video solution is innovative in that it allows an interactive platform to discuss physical objects in meetings which is very useful in Retail, Construction, Manufacturing industries for use cases like remote store layout review, and remote troubleshooting, etc. The solution allows for opening of action items with annotated video screens for a seamless workflow during meetings. 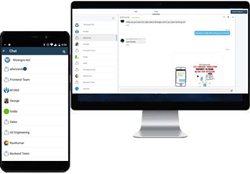 Wizergos, a SaaS based software solutions provider, has launched Voice, Video, and Screen Sharing services as part of it flagship Meeting Management Platform. The software is designed from ground up with the intention to provide a secure enterprise grade platform to run all operations and project meetings, specially cross functional senior management meetings. The Wizergos solution is custom built for running senior management meetings with features like Action Item tracking, Resolutions, Automated Minutes. Managers in various sectors like Retail, Construction, BFSI, Manufacturing, Healthcare are using Wizergos to run and track all their meetings. The solution is available both as a web app and mobile apps for iOS and Android. About Wizergos: Wizergos, headquartered in Bangalore, offers SaaS based solutions in the areas of collaboration and task management using advanced Speech Recognition and Natural Language Processing. Its flagship product, Meeting and Action item management software, is used in BFSI, Retail, Education, Construction and Healthcare markets.